The Salton Sea in California is facing a problem that the salinity has been increasing for the rapid evaporation rate. The reading passage has given three solutions while the listening part reveals the leak of them one by one. The first option is to remove the salt directly from the lake’s water by a special desalination facility. However, the professor argues that this method is very likely to cause health problems. As the water in the desalination facilities evaporates, solid materials would be left behind, which contain toxic chemicals, such as selenium. Then, separating would allow these chemicals to be spread by wind, which may pose a threat to people’s health. The second solution is bringing ocean water to the lake to dilute the salt level. The professor finds faults with this method by saying that this solution would be quite unrealistic in consideration that the government may not have enough money to build any pipelines or canals. Moreover, the nearest shoreline is 100 kilometers away, so the construction may cost a lot of money. The last way is to divide the lake into several sections by building walls. The salinity in smaller sections would increase while in largest sections, by directing fresh water from small rivers, the salinity would be controlled. 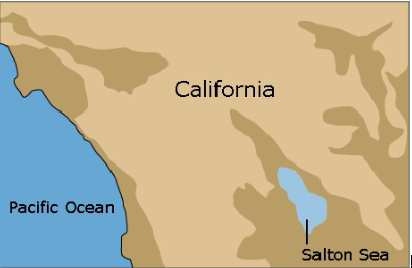 However, the professor refutes that this measure is just provisional, since the Salton Seas is located in place where the geological activities are frequent and intense. Water from the smaller sections may mix back in the main section so this solution will also fail very soon.